Their unique architectural shape and spectacular foliage adds instant dramatic impact to any garden. Despite their tropical origins, these exotic plants thrive in the UK and are winter hardy to -6. They love a sunny position and are perfect for patio pots! Supplied as a pair of mature potted plants, approx 70-80cm tall (3ft) tall and in 15cm diameter pots. A relative of the date palm, Phoenix canariensis is a large palm tree, with spreading deep green leaves arching elegantly from its attractive, stout trunk. During a hot summer, drooping bunches of creamy-yellow flowers may appear. Holding a prestigious RHS Award of Garden Merit, the Canary Island date palm makes an excellent evergreen specimen plant for the patio or conservatory. Phoenix canariensis enjoys a sheltered garden position in the UK, although will cope with temperatures down to -6C (21F). The Phoenix Palm is undeniably impressive and can grow to more than 12m in its native Canary Islands. Fortunately, here in the UK and when restricted in a container, it reaches a much more manageable height of 1.5m (5'). Supplied as a pair of mature potted plants, approx 70-80cm tall (3ft) tall and in 15cm diameter pots, ready to plant outside from the end of April. I have just received a pair of Phoenix Palms from you. They are stunning, at least as big as advertised and exceptional value for money. My first time - but I'll be back for more. They will be supplied as a pair of mature potted plants, ready to plant outside from end April. For heights, refer to each product option. Despite looking like desert palms and being drought tolerant, to get best results, water them really well in spring & summer - do not let dry out. In colder spots, bring in for winter, or tie fronds up together in a bundle to protect the centre of the palm. If you're lucky enough to get shoots at the base of Phoenix canariensis, these can be arefully detached, along with any roots, and used for propagation. Pot each shoot in an 8cm (3 inch) pot of the standard potting mixture, place it in bright filtered light and water it sparingly-just enough to keep the mixture barely moist. After new top growth indicates that the shoot is well rooted, treat the young plant in the same way as a mature Phoenix canariensis palm. A slowly growing tree, Phoenix canariensis is easy to grow and care for . 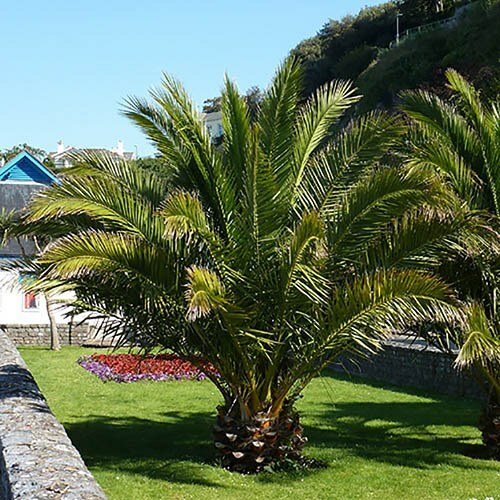 Thriving in a sheltered site in full sun, with some shade at midday the Phoeninx Palm is best grown on the Patio in a large pot and brought under cover in the winter. When in growth, watering moderately and feed with a balanced fertiliser once a month at half strength. Water sparingly in winter. If the plant becomes pot bound, pot on into containers 2.5cm (1 inch) larger when new growth starts in spring, using a compost with good drainage. In years when re-potting is not carried out, topdress by removing 5cm (2in) of old compost from the top of the pot and replacing with fresh. Pruning will only be needed to remove old fronds, which hang below horizontal. Do not remove those growing upright since this may slow the growth and reduce the palm vigor - remember that this palm has spines and sharp edges; use extreme caution when handling.